When it comes to food, my ex-husband (yes, unfortunately I have one of those tucked away) used to call my mother Julia the Human Photocopier. We would take her out to to a café or restaurant, she would sample something new, then come home and (sometimes the same night) promptly cook up what she had just eaten, usually with amazing results. I used to baffle over as to how someone could taste something just once, be able to identify the flavours, and work out the ingredients from there. (I reckon my mother could pass the Gordon Ramsay flavour taste-test on Hell’s Kitchen with flying colours.) I suppose the ability to do this comes from a lifetime of loving food, coupled with an enormous amount of time spent in the kitchen, such is in the case of my mum. It’s as though my mother has an ability to see “into” the food and work out what it’s made up of. Somewhere along the way, a long time ago, I brought home some cheese pastries and my mother set about recreating them with huge success. When I found out I had a wheat allergy some years back, she first reacted with shock (I’m the first in my family to have any kind of allergies), then created this gluten-free version using a combination of flours which work beautifully. After all, there’s nothing my mother loves more than a cooking challenge. What we have here is a highly addictive savoury pastry which goes dangerously well with beer or a glass of wine. They fill the house with the most delicious aroma when they’re baking, and as good as they are straight out of the oven, they are even better the next day. If you like a slightly chewy pastry, bake them for the thirty minutes. If you prefer a crispier, more biscuity style, leave them in the oven for an extra five minutes. Either way (be warned), they’re dangerously moreish and very addictive. Makes 10-12 straws approximately 20cm/8″ in length. Prep time 30 mins, cooking time 30 mins. * My mother has always used lemon juice in her much of her pastry making, both in standard wheat doughs as well as gluten-free ones. Acids work to coagulate protein strands and assist with the dough coming together and creating flakiness in the resulting pastry. 1. Heat oven to 180˚C (350˚F). Line two baking sheets with non-stick baking paper. 2. Combine the two cheeses in a small bowl and set aside. Combine flours, baking powder, xantham gum, sugar and salt in a small mixing bowl. Make a well in the centre and pour in the beaten egg. Add the cubed butter and half the grated cheese, using a butter knife “cut” the flour into the butter and cheese until it resembles bread crumbs. 3. Pour the butter, cheese and flour mixture onto a floured tabletop or wooden board and gently gather the dough. Into the centre pour the lemon juice and two tablespoons of water. Begin gently gathering and kneading it together until it forms a ball. (The dough will be quite fragile but will come together with some patience.) If it is a little dry, add the third tablespoon of water. 4. Cut the ball of dough in half and roll each half out into approximately 5mm thickness sheets making sure you flour the work surface and the rolling pin as the dough can be a bit sticky. Cut the sheets of pastry into approximately 4cm/1.5″ x 25cm/8″ lengths. 5. Using a long spatula gently transfer each pastry straw onto the baking sheets and bake for fifteen minutes. 6. 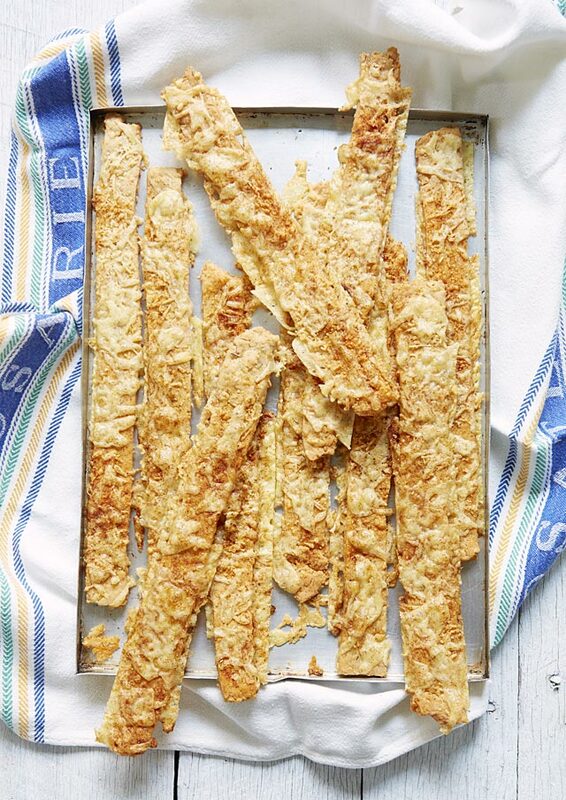 Remove the pastry straws from the oven, scatter over remaining cheese and finally the sweet paprika, bake for a further 15 minutes (20 minutes if you would like them to be crunchier). Allow to cool on the trays. I wanted to shoot these pastry straws overhead in a very graphic style. The vintage aluminium baking trays (which are hands-down better than any modern baking tray I’ve owned) came from a local op-shop and the vintage tea towel came from the Salvo’s. The background is recycled fence palings banged together and painted white to make a rustic surface. The only light used in this image is window light. Tanya, these sound fantastic. I am a lot like your mother in that I will copy at home what I’ve eaten in a restaurant.